Mental Math. The previous lesson I encouraged folks to practice mental math, adding and subtracting. In this video I will suggest a couple of tricks that can make it easier to do calculations in your head. Remember, even though you get a calculator on the GRE, doing as much mental math as possible is an enormous time saver. People don't realize this, if you're reaching for the calculator on every single problem that's gonna take everything much longer on the math section and you're gonna run into time problems. Can be a time crunch at the end. Its much more efficient to use the calculator as little as possible and to rely on mental calculations as much as possible. 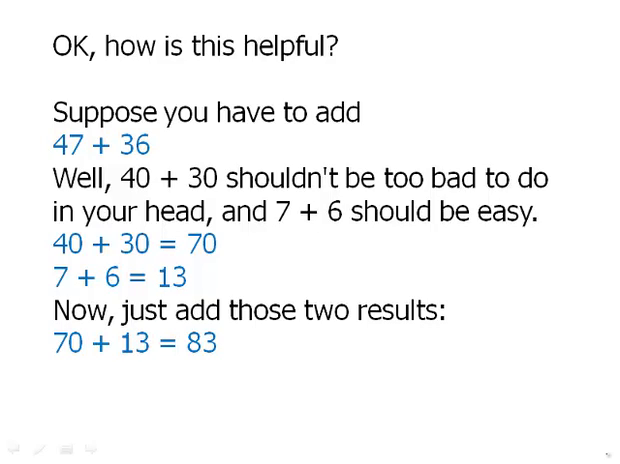 In this video, I hope to encourage that you can add or subtract any two digit numbers in your head. Practice with this until you're confident with it will enormously strengthen your overall confidence with arithmetic. And again let me say, these, these tricks I'm gonna show, they may be unfamiliar, it's gonna take time to practice them and get comfortable with them. But once you get comfortable with them, you can really master this stuff, and it will enormously to your advantage. The first trick is simply to remember, of course, that every two digit number can be written as the sum of a multiple of ten and a single digit number. So for example, these numbers can be written this way. Multiples of ten plus single digit numbers. This is just ordinary place value, there's nothing particularly sophisticated here. Okay. How is this helpful? Suppose you have to add 47 plus 36. Well think about it this way, 47 of course is 40 plus 7, 36 is 30 plus 6. We can separate out, we can add separately the multiples of ten and the single digits. 40 plus 30 shouldn't be too bad to do in your head, and 7 plus 6 should be easy. So we add those. Now, we just have to add those two sums, put that all together and of course 70 plus 13 is 83. That's the sum of the original two numbers. Now, try a few of these on your own. You may find it helpful to pause the video as you try these. These are the results here. We can use this same fact at least some of the time for subtraction as well. If each digit of the first number, the tens digit and the ones digit, is bigger than the corresponding digit in the second number, then we an separate by digits to simplify the subtraction. So for example, if we have 59 minus 31, we can sub-, think of each one of those as a sum, 10 digit plus 1 digit. We can group them, so we're subtracting the, the multiples of 10 and separately subtracting the 1 digits. So 50 minus 30 of course is 20, 9 minus 1 is 8, putting those together, and the result is 28. Here are some more subtraction problems of this genre. Pause the video and practice these in your head. These are the results here. What about if the smaller of the two numbers, the one you subtract, has a bigger ones digit? So for example, 56 minus 19, the 9 is bigger than the 6. What do we do here? Well, for this one we can't simply treat the digits separately. Grade school math teaches folks about, borrowing a 1 from the tens column, but that's a pain for mental math. Instead of the "borrowing" thing, think about it this way. If we are subtracting any two numbers, we could add a new number to each of them, and the difference wouldn't change. So for example, a minus b, a minus b will equal a plus k minus b plus k. In other words, if we add the number k to both a and b, the difference stays the same. In essence, in doing this, we're adding both positive k and negative k.
One of the k's is being added and one of the k's is being subtracted. And of course k plus negative k is 0, adding 0 doesn't change the difference. We will take advantage of this fact by adding just enough to the smaller number to move it up to a multiple of ten. So for example, 56 minus 19. Well 19 is one less than 20 so I'm gonna add 1 to it. Well if I add 1 to that then I have to add 1 to the other. So, 56 plus 1 is 57. 19 plus 1 is 20. Then when I do the subtraction, it just subtraction in the tens digits. So, 50 minus 20 is 30. The answer is 37. Another example. 71 minus 26. 26 is four less than 30, so I want to add 4 to that. If I add 4 to the first one, I have to add 4 for to the second one also. I have to add 4 to both of them. So adding 4, 71 moves up to 75, 26 moves up to 30. Well now again, we just have to do subtraction in the tens digit, and the answer is 45. Here are some more examples for practice. Pause the video here and practice doing these in your head. And here are the results here. In summary, practice mental math. This was the first video in which we're going to discuss mental math tricks. The more you can learn these mental math tricks and apply them and practice them, the more efficient you'll be on the quant section and also just the more confidence you'll have with math overall. You can simplify mental math for the addition of two digit numbers by treating the digit separately. You can also treat the digit separately in subtraction if the number subtracted has both digit smaller. And we can also simply subtraction by adding the same number to both terms.